Nice furniture can be costly, and when you find a piece you love it is not easily replaced. An unsightly stain on your couch can make a poor first impression on guests and lower the appeal of the entire room. Being that the sofa is often the gathering place for the family, it is a very likely location for spills and other accidents to occur. Add children and pets to the household equation, and the chances of a couch stain increase even further. Thankfully, there are steps you can take to keep your upholstery spot free. Keeping the house clean with kids and pets is a challenge and messes are inevitable. In this article Housekeeping provides some great tips for stain proofing your couch. In the San Jose Mercury News Sunday paper on 7/7/13 there was an article that caught my attention; “Too Little Too Soon.” In her article discusses the topic of bikinis and young girls. This grabbed me right off the bat as my daughter is eight and trying to keep her wearing age appropriate clothing, swim suits included, is a challenge. My daughter has had two bikinis over the last couple years and I have not been okay with either of them. The swim suits were both purchased as gifts and I have let the gift giver know, respectfully, that I do not think a bikini is appropriate for a girl my daughter’s age and to please refrain from purchasing one for her. Maybe I am a little opinionated because I am a father and that’s my little girl, but the bottom line is I am not okay with it. I just do not understand why young girls in elementary school need to wear skimpy swim suits and why apparel designers even make bikinis for such a young age group is beyond me. The article is a great read and provides insightful information about the psychological development of young girls. It also discusses the effect on body image and self-esteem as influenced by the median and how we as parents discuss these issues with our daughters. I found the article very helpful and enlightening. I definitely do not want my 8-year old wearing a skimpy bikini but at the same time I do not want to foster any negative body image or self-esteem issues either. Read the article and I would love to hear your comments, opinions and experience with any of the related topics. Electrical components are an increasingly essential part of everyday life. From the television, media player and cable box on your entertainment center to the computer in your office and the lamp on your desk, it seems like everything is plugged in these days. While dangling cords are unsightly and lend a cluttered appearance to an otherwise orderly room, they’re also a hazard for households with small children. I don’t know about you but our house has wires coming from everywhere. They seem to multiply overnight. Between computers, TVs, DVD players and all the other electronic components, there is spider web of wires all interconnecting to make everything work properly. All the new technology is great and sure makes life easier but all those wires can pose a hazard to your little ones. How to Hide Electrical Wires from Computers, TVs and Small Appliances is a great article that has some great tips on how to protect your little ones from all the wires in your house. wonder how I find time to do anything but work. It is definitely challenging and takes some creativity but it must be done. All work and no play is no life to have, at least not for me. There is a long list of things I love to do but my four of my biggest passions are mountain biking, trail running, cooking and gardening. What makes these really great is that I can include my family in all of them. My son recently got his first mountain bike and I get him out every once in a while and I get the whole family, dogs included, out on the trails when I run. Gardening and cooking with the kids is a no-brainer in my house; they both love to participate in both activities. All of these activities bring me joy and peace and are also a great way to relieve stress. This post is about gardening. I don’t have a huge backyard but I have become very creative with the space available. I have a ton a vegetables and quite a few fruit and nut trees. There is nothing better than walking in the back yard and harvesting some fresh fruits and vegetables for a snack or meal; truly “farm” to table. 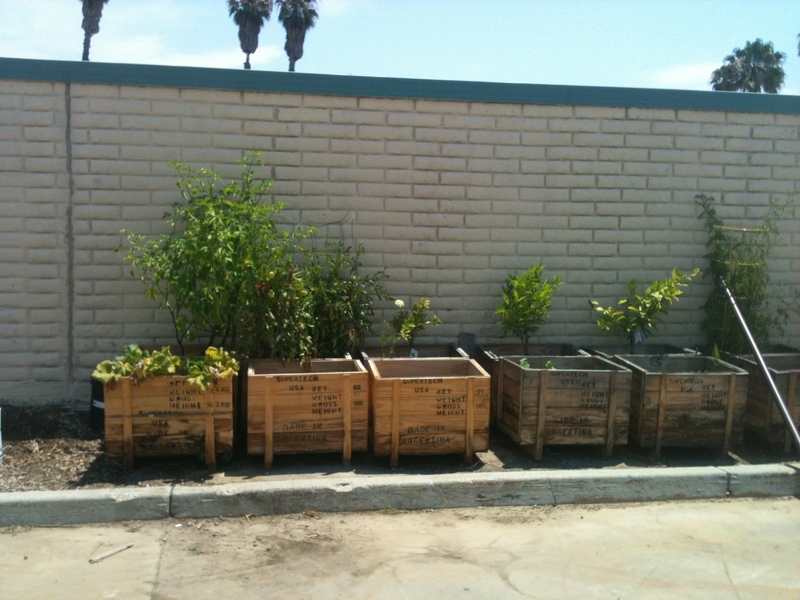 The last few years I have started gardening at the Go-Go Babyz warehouse. One of our neighbors had these wooden shipping crates that they were just throwing away. I always thought to myself “what a waste.” So I started grabbing some and using them for storage at the warehouse then one day it dawned on me that these bins were the perfect size for container gardening. The first year I started with just a few containers and it went so well I have added more every year. This spring I filled a dozen containers. Three are permanent with dwarf citrus tress but I grow lettuce or herbs on the edges. The rest are filled with everything from tomatoes, onions, beets, carrots, squash and a variety of peppers. I always joke that if Go-Go Babyz needs more sales I will open up a produce stand; diversification. 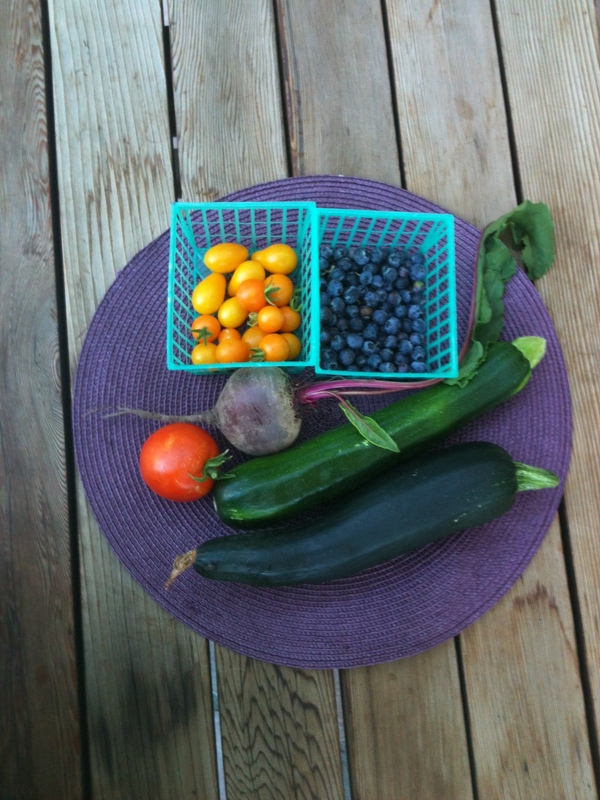 I try to eat organic foods whenever so everything is grown organically. It is always comforting to know that my food is both fresh and organic. What a reward for all the hard work, both in the garden and the office, to be able to pick something fresh and eat it immediately or prepare a meal with the freshest ingredients. Because I spend a lot of time gardening and prepare delicious meals with the harvest, my kids have really taken a liking to gardening. They don’t spend as much time as I do but they love to join me for a while. And every time they visit the office they want to go out back and check out garden and water it if it needs it. It’s a win-win; I get to spend quality time with my kids, grow healthy food for them, pass on some great skills and teach them about health & nutrition. Some of these may seem obvious but it can be easy to plant some organic seeds and find out you have a pest or fungus problem and use a non-organic product without thinking. When it comes to parenting, there are almost as many incorrect myths and pieces of bad advice as there are scientifically sound facts passed around. From the moment you announce your impending addition to the family, you’ll be inundated with unsolicited advice of questionable veracity. These ten developmental facts, however, are among those that you should arm yourself with so that you are prepared and well informed about your little one’s growth. Very interesting article on child development. It is definitely a good read and gets you thinking. Some items may be controversial and open up the window for a variety of opinions. I know from raising children that you can get 10 different answers from 10 different parents who were all asked the same question. Can anyone relate? The last point is my favorite and I agree 100%. I don’t know what Kerry and I would have done if we didn’t have the help of family and friends. Take a moment and read the entire article and I would love to hear your comments and opinions. Feel free to stat a discussion here or on the original. You ever see a great product out there and say to yourself “why didn’t I think of that?” I have done that a lot, still do actually. As you probably can guess, I have also created products based on those ideas at Go-Go Babyz. Sometimes I tell myself I should have just left it as an idea because running a manufacturing business can be pretty stressful. But I digress. The innovation and design is a collaboration of all the creative minds at Go-Go Babyz, I don’t take sole credit for any one product. Despite the headaches that come with running a business it is pretty neat to see a product being used by a stranger that all started in your head. Especially when it is making their life easier. That is the basic concept of the creation of Go-Go Babyz; making life easier for busy parents. Our very first product that we designed was born from an idea when we were traveling with our 6 month old son for the first time. What a hassle it was getting through the airport with a car seat, diaper bag, a stroller and all the other baby gear, not to mention our own stuff. 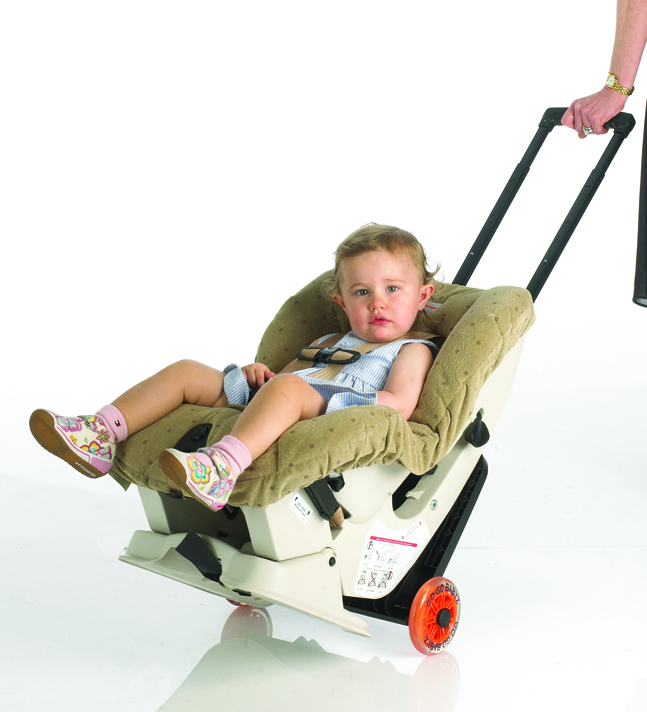 That product is the gogokidzTravelmate – the original car seat stroller. 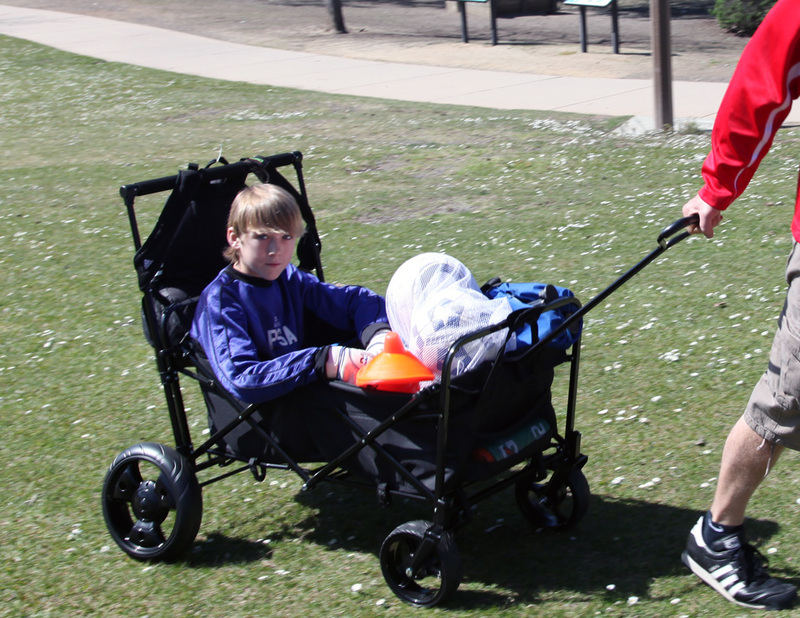 Recently we introduced the Go-Go Babyz Wagon Stroller but we have been developing it for a few years now. Throughout the process of testing different prototypes we got plenty of “that’s a great idea” & “why didn’t I think of that.” See, most of the products we develop are based on products that we want to use with our own kids. As we are out and about with our kids we often think to ourselves “there has to be a better way” and the wheels of innovation start turning. Back on that beach is where the Wagon Stroller idea started and a couple moths later when Kerry was coaching we decided that we really need to do this. We knew our kids didn’t necessarily need a stroller anymore but we thought that we would have loved to have a folding wagon that was designed with all the safety features of a standard single or double stroller. So three plus years in the making the Go-Go Babyz Wagon Stroller is out and available for all to enjoy. We use it ourselves with our kids even though they are older. We love to take it to the farmers market and throw all our stuff in it and if one of the kids gets tired of walking they can hop on in. We also use it for lugging all the soccer gear to the field and after the game if our super star goalie is tuckered out he can hop in too. There is plenty more that we do with it but I’m tired of writing. I hope all of you enjoy it as much as we do. There is so much it can do and it really does make life easier when you are out and about with your kids and all their gear.